Here in Newcastle, we have approximately 60 reading groups that we support. Due to resources, the majority are now facilitated by library customers instead of staff, although we do still facilitate a few which include a poetry group, a group for visually impaired and a shared reading group (reading aloud). We have added all of our groups on the Reading Groups for Everyone website, managed by the Reading Agency, which encourages residents to get in touch if they are interested in joining, as it also highlights any vacancies. We have a reading list for the groups to choose from which is currently being updated and will be available online. Our groups are also encouraged to bid independently for free titles from the noticeboard on the Reading Groups for Everyone website, which not only enhances our collections, but encourages our groups to become more interactive and feedback comments to the author. 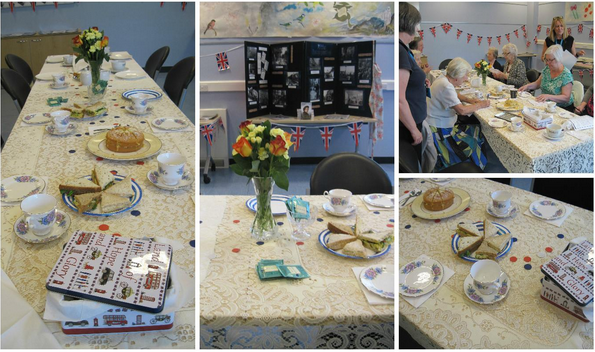 As an example, recently one of our groups based in Gosforth Library placed a bid and received copies of ‘Without a Trace’ by Lesley Pearse and along with this collection of books came bunting, biscuits and Fortnum & Mason tea bags to support the group with a coronation tea party (courtesy of the Reading Agency). In return, the group has to use social media to promote the event and to submit reviews and share photographs of the event. Needless to say, the feedback from this group was ‘more of the same’ as they enjoyed it so much! The weekly Shared Reading group is very important to us as it offers a different approach to more traditional groups. We have dedicated trained staff who deliver these sessions which involve carefully choosing a short story and poem to read aloud and discuss with members, lending an immediacy to the reading experience. This is both relaxing and encourages social interaction through sharing how what we have read touches our own lives. This is a weekly programme and we have one group facilitated by staff and another group delivered by a recently qualified volunteer. Feedback is important to us, and part of our evaluation programme is seeking feedback from the reading groups. This is carried out by each group once per year to make sure we are delivering our service to a high standard, linking in with our key priorities and providing an opportunity to listen to our customers. Every year we link in with the ‘Big Read’ delivered by the Theakston’s Old Peculiar Harrogate Crime Festival. This involves the majority of our reading groups, reading the same book (chosen by the Harrogate Team) and coming together to meet the festival reader in resident to share views. In the past, we have partnered North Tyneside Libraries in a trip to the festival held at The Old Swan Hotel, once the famous retreat of Agatha Christie. This sees ardent readers from far and wide coming together in this wonderful setting and sharing their passion for crime writing. Events include world famous author interviews, panel discussions, competitions, book shop and author signings all washed down by a steady supply of refreshments! Our popular reading scheme in 2015 was the Six Book Challenge, now known as Reading Ahead. In the past, we have worked with local colleges and schools but, in 2015, we also worked with Newcastle City Learning and Newcastle branch of Unison. The scheme ran from March until June and the partnership provided a wider reach to adults with 150 enrolments and 85 completions which was an increase of 50% compared to last year. The celebration event saw all of the groups mixing together, with certificates presented along with goody bags, and this provided an opportunity to discuss the books which people had enjoyed …and in some cases had not enjoyed.